A mechanic at Tokyo's Narita airport found the dead body of an apparent stowaway in the wheel well of a Delta Air Lines 777 that had recently arrived from New York's JFK airport. According to CNN, Delta Flight 59 had departed JFK at about 12:53 pm on Saturday February 6th, and arrived in Tokyo at 4:46 pm local time on Sunday. According to the Mainichi Daily News, the body was found about 80 minutes after the airplane landed. There was no identification on the body, and Japanese authorities are trying to identify him. The body reportedly had no visible injuries except for signs of frostbite. 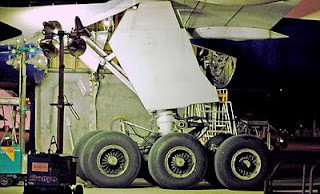 The wheel well area of the 777, like that of most jet airliners, is unpressurized and unheated. Temperatures can fall well below -40 degrees during a flight, and can stay that low for several hours. Also, there is not enough oxygen at high altitudes to prevent hypoxia, and that alone can be fatal. There is no way to access the 777 wheel well from the passenger cabin, and it is highly likely that the stowaway got into the wheel well at a previous departure airport. If that airport turns out to be JFK, this represents a very serious breach of security because it demonstrates that it is possible for someone to get close to an airliner on the ground without being stopped by security or by other airport staff. As is the case with entering the secure part of an airport terminal, no one is allowed to access to the airport apron or runway areas without authorization and without passing through some kind of security. If it turns out that the stowaway got into the aircraft at a prior departure airport, it would still represent a potentially catastrophic lapse of security since it would imply that routine maintenance and security checks between flights would have been unable to find something as large as a man that was hidden in a wheel well. So far, Delta, the airport authority that runs JFK, and the US Department of Homeland Security have not made any formal statements about this apparent security matter. Reports of stowaways in jet airliner wheel wells are fairly common, typically involving someone from an economically challenged country attempting to fly to western Europe or North America. Unlike fatal events involving passengers, crew members, or airport ground personnel, deaths to stowaways are not routinely tracked by national or international civil aviation authorities. Given the heightened danger from individuals and groups intent on destroying airliners, it would make sense to treat all stowaway events as serious security matters that should be both tracked and investigated by the appropriate authorities. Our Airline Passenger Management System (APMS) is designed to monitor,manage and control passengers during flight as a way to deter terrorists. However, we have found that the APMS has distinctive safety and value added advantages that have been discovered in evaluating its functionality. After reading about this stowaway,it would appear logical to monitor the wheel well area for stowaways or a potential terrorist. Our Security Programme follow the standard security measure how to protect the stowaway...just DO Pre Flight Security Check before flight consistently. "There are un-secure Airport in the world" so we have to provide security measure for this incident to avoid this issue happened again. What if he had been a suicide bomber?